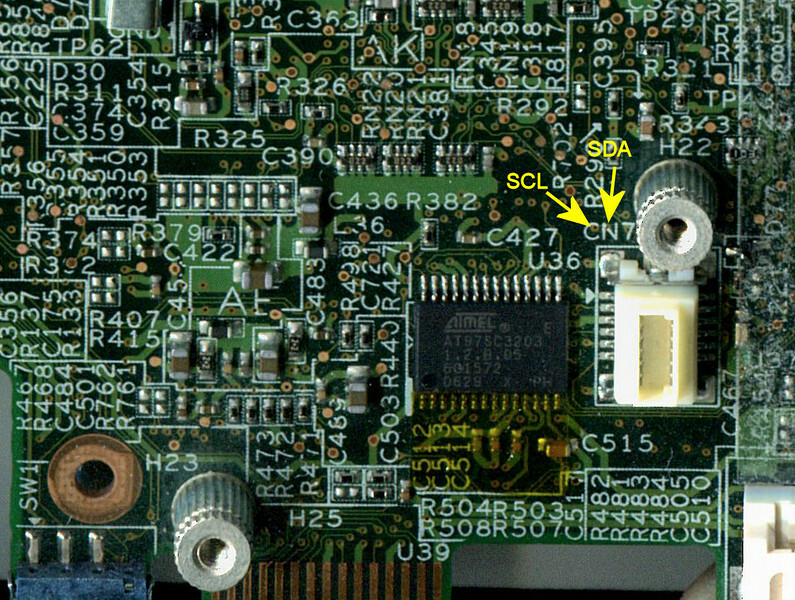 There are different versions of the System Board. Some versions allow access by simply removing the keyboard. 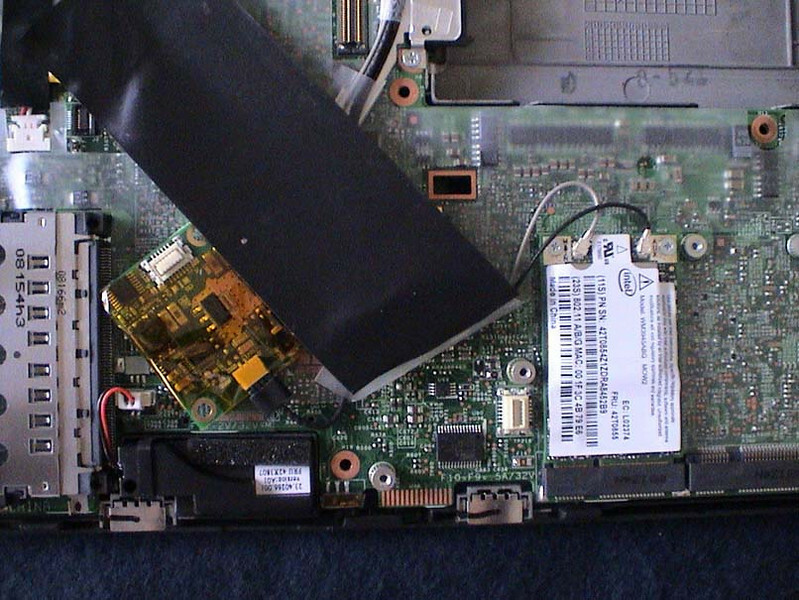 Others require completely dismantling to access the connections on the underside of the System Board. 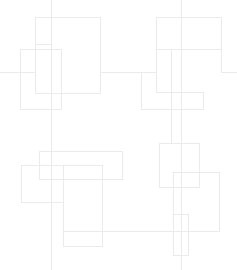 Review the connection points on this page BEFORE deciding how much dismantling you need to do. 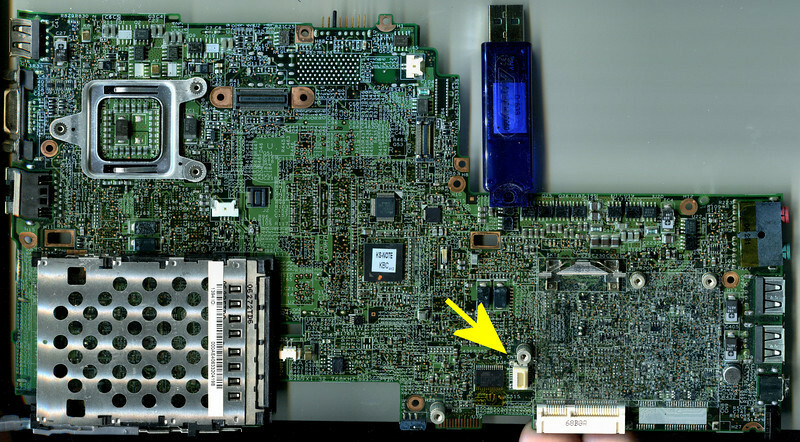 In the Hardware Maintenance manual scroll down to System Board, follow the instructions in the manual to remove all the other FRUs to gain access to and remove the System Board. 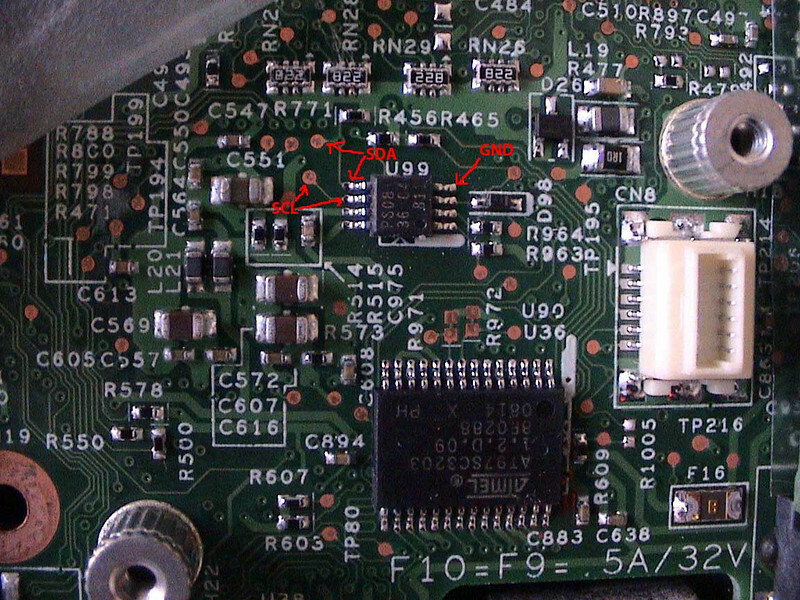 You need to access the pads of the ATMEL 8356908 chip illustrated below. 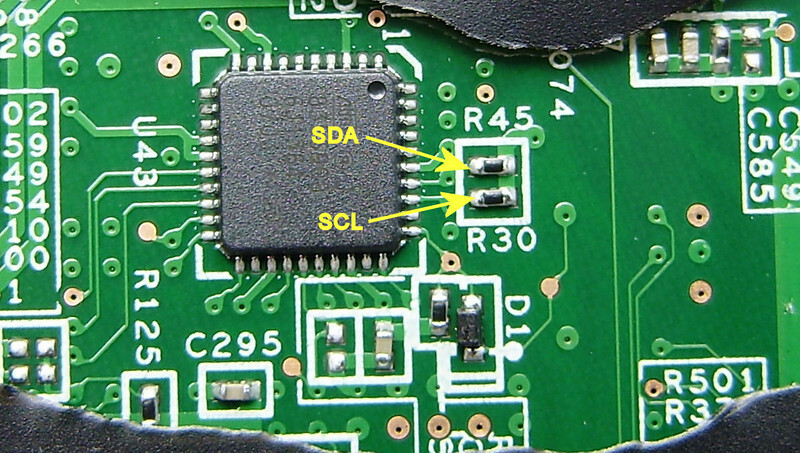 Note: SCL is the 3rd pin back from right hand the end, SCL pin is marked RED in the photo below. 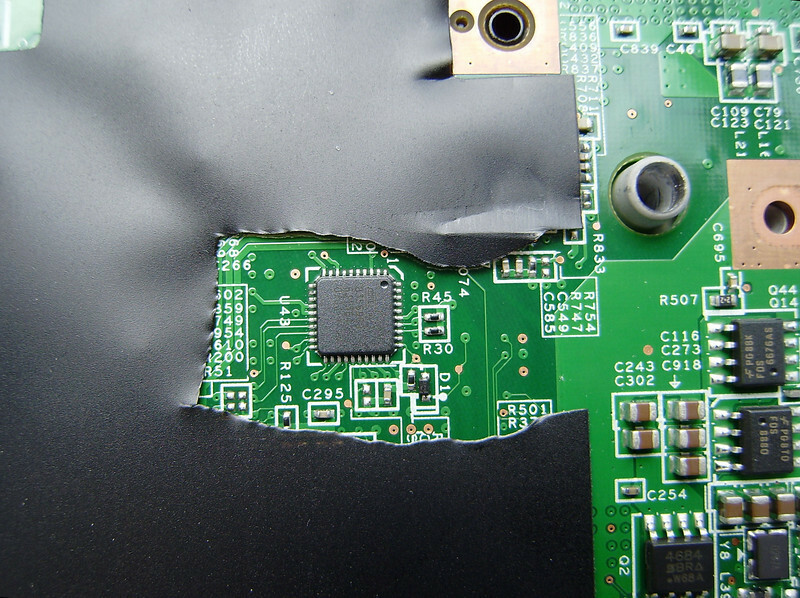 A different System board, ATMEL 8356908 - no need to butcher the black plastic as it can be easily lifted up out of the way, stick the black plastic back down when you are done. Basically you make the System board functional outside of it's case [IF you had to remove the System Board] which includes mounting heat sink and fan on CPU. Basically you make the System board functional outside of it's case [IF you had to remove the System Board] which includes mounting heat sink and fan on CPU. Basically you make the System board functional outside of it's case [IF you had to remove the System Board] which includes mounting heat sink and fan on CPU. Basically you make the System board functional outside of it's case [IF you had to remove the System Board] which includes mounting heat sink and fan on CPU. 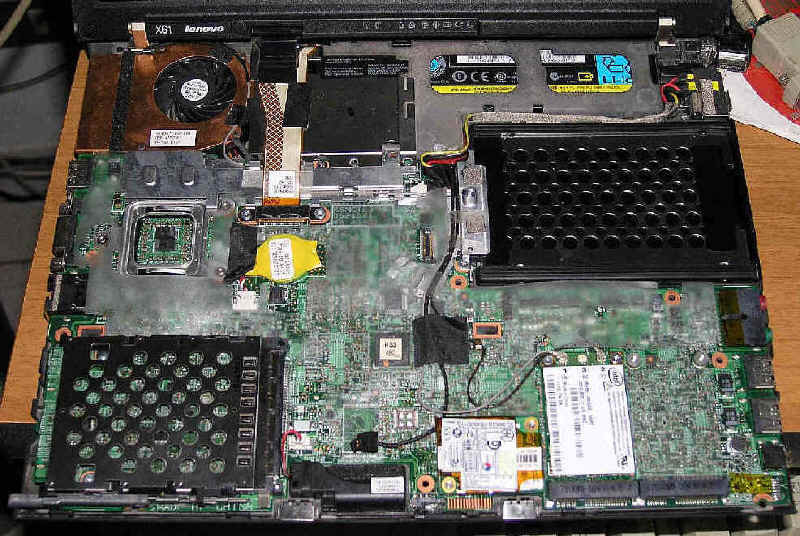 Basically you make the System board functional outside of it's case [IF you had to remove the System Board] which includes mounting heat sink and fan on CPU. Basically you make the System board functional outside of it's case [IF you had to remove the System Board] which includes mounting heat sink and fan on CPU.